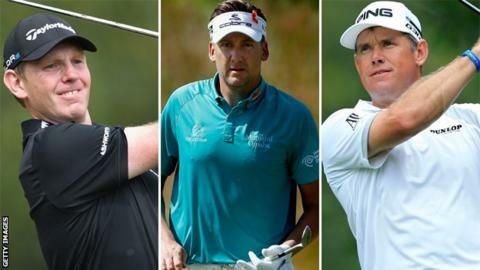 Debutant Stephen Gallacher, Ian Poulter and Lee Westwood are the three wildcard selections for Paul McGinley's European Ryder Cup team to face the USA. England's former world number one Luke Donald, who has played in four of the last five Ryder Cup tournaments, misses out with Italy's Francesco Molinari. Scot Gallacher came within one place of securing an automatic Ryder Cup berth at the Italian Open on Sunday. The Ryder Cup takes place at Gleneagles in Scotland from 26-28 September. Donald was part of the Europe team that recorded a 14.5-13.5 victory over the United States at the last Ryder Cup in Medinah in 2012, and has taken 10.5 points from a possible 15 since his 2004 debut in the competition. The 36-year-old has struggled for form recently, finishing in in the top 35 only once in his past nine tournaments. "It was a very difficult conversation with him for a number of reasons," McGinley said of his decision to overlook Donald. "My relationship with Luke is very close. He has played in every Ryder Cup I've been involved in apart from 2008, which we both missed. "I've partnered Luke twice, in 2004 and 2006, and vice-captained him in 2010 and 2012. I forged a very strong relationship with him. "His Ryder Cup record is outstanding and he will no doubt go on to make many more appearances in the Ryder Cup. It was a difficult call but one I had to do in the interests of the European team." Donald later posted on Twitter: "Thanks for all the lovely messages, obviously gutted to not have made the team, but wish all the lads the very best #GoEurope." McGinley said Gallacher's third place at the Italian Open was a crucial factor in his decision to hand the 39-year-old a Ryder Cup debut. Gallacher would have taken Graeme McDowell's position as the final automatic qualifier had he finished in the top two in Turin. "As a rookie you have to earn a little bit more to earn a pick, and I think Stevie did more than a little bit more," he said. "His performance last week had a huge effect on me. He really had to go some and he did." Gallacher was unsure whether he done enough to warrant a wildcard pick when he failed to secure a top-two finish at the Golf Club Torino. "My emotions were a bit mixed. I was delighted with the way I played but I was disappointed that I did not qualify automatically," he said. "I still had it in my head that I was up against a lot of really good players for the picks as well." Westwood lies outside the top 100 in the FedEx Cup rankings, but the eight-time Ryder Cup participant has upped his game in recent weeks, carding a final-round 63 at the Bridgestone Invitational last month before finishing tied for 15th at the PGA Championship the following week. "When Paul rang with good news, I breathed a sigh of relief," he said. "I have played a lot better in the last month and a half. Paul asked us to show some form, and I think I did that in the final round of the Bridgestone and by leading the PGA Championship the following week." Poulter has not had a top-10 finish since June, when he finished sixth at the St. Jude Classic in Memphis, but the star of the 2012 Ryder Cup in Medinah is hopeful that he will recover his best form in time for Gleneagles. "I'm very proud to be a pick and I just can't wait to get there. The Ryder Cup means a lot to me and I guarantee I'll be ready to perform to my best," he said. United States captain Tom Watson will make his three wildcard selections later on Tuesday. Former world number one Tiger Woods has ruled himself out of contention through injury. The 38-year-old, who failed to qualify automatically for the Gleneagles event, has been suffering from a persistent back problem.